The Big Blue House at Tucson Arizona Bed and Breakfast Inn. 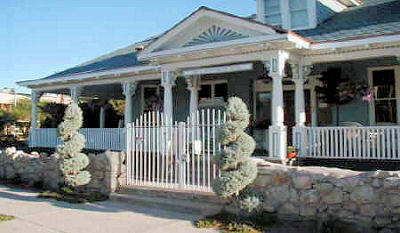 A Unique, Upscale Tucson Bed and Breakfast. University District Studio Suites. The Big Blue House, Tucson bed & breakfast, is far more convenient and a better value than most any hotel in Central Tucson. Park your car in front of your room and walk to the local restaurants and shops. Upscale extended-stay furnishings, great amenities, extra private and the best location in Central Tucson. One of the most unique and historic homes in Tucson. Built of solid Redwood and Maple by the master craftsmen of Tucson's Rondstadt Family in the summer of 1899.